Weil’s health caution raised the question: why aren’t all strawberries grown organically? Eric explained that, “while it isn’t hard to grow strawberries organically, it is hard to raise organic strawberries cheaply.” Farmers focused on the least cost rely on pesticides while farmers who choose to raise strawberries organically offset the extra cost by selling them already picked at a premium price. Eric and Elf are an exception among organic farmers, using the pick-your-own option to help offset the extra cost and make the berries more affordable. So, we’re doubly lucky here on Lopez: healthy berries at a good price. However, these berries are more than healthy and affordable, they are delicious, and that’s because the main criterion Eric and Elf use when selecting varieties to plant is taste. Their passion for taste even caught the attention of their plant supplier. The varieties that met Elf and Eric’s taste criterion this year are Benton and Hood as their June berries and Tristar, a variety that produces largely in August. Eric figured for a minute on a scrap of paper and then reported that they have nearly 13,000 plants, almost a mile and a half of rows. That’s a lot of berries! Pick them from June through Labor Day on Tuesdays and Fridays from 9:00 to 3:00 at the farm, 3759 Port Stanley Road. It’s best to come early because they sometimes sell out before 3:00. If you can’t pick your own, you can order flats Monday–Saturday to pick up at the farm, or you can buy them at Blossom where they’re delivered fresh daily, or eat them at Vita’s or Edenwild. 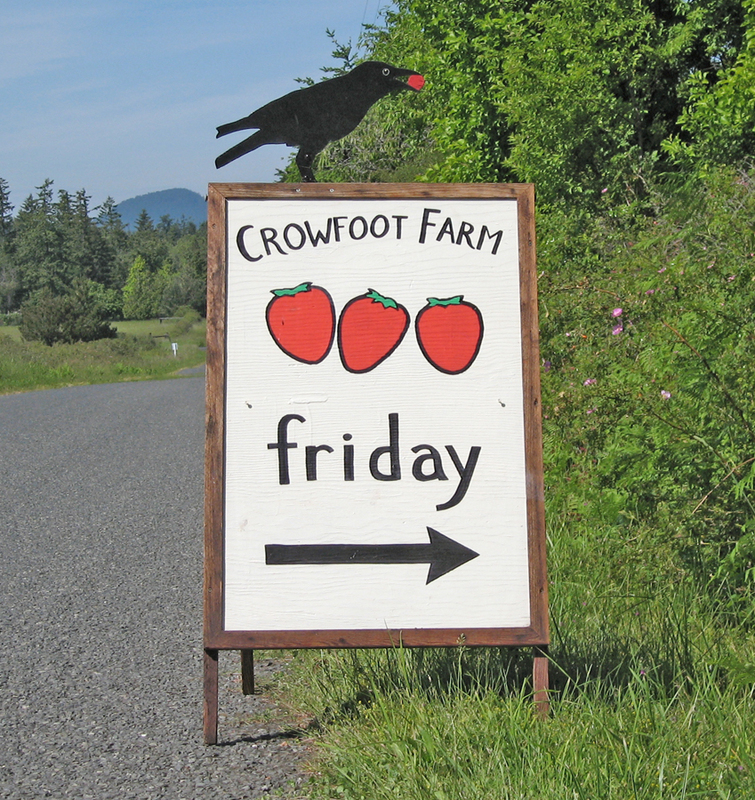 However you get them, enjoy the amazing taste of Crowfoot Farm strawberries and find a minute to thank Elf and Eric for what they give us each summer.